I could eat bread at every single meal. It makes a fine side, a scoop for liquidy items, a delivery system for meats or cheeses, a reason to get up in the morning. Well, not the only reason (unless you count toast). I COULD eat bread at every meal, but I DON’T because tied to that carby goodness is the fact that as much as I love bread, it is not good for me to eat as much of it as I’d like. In order to justify bread consumption, I try to pair it up with equal or greater portions of veggies. Although that ratio is not nutritionally proven in any way, it makes me feel better, mentally and physically. And as anyone who is on day one of a no-carbs diet can tell you, bread is definitely tied to a positive outlook on life. This salad uses the standard components of a Panzanella salad – tomatoes, cucumbers, and cubed bread. Instead of using dry, old bread, I like to grill the baguette to give it crunch and added flavor. And as long as you’re going to grill, might as well throw the onion and romaine on there as well to add a smoky, warm, and slightly wilty twist to the traditional salad. Even though chicken isn’t always used, I like to make it a complete meal by adding protein to the mix. The dressing for this salad is a little lighter than the norm, but it packs plenty of flavor without adding much extra fat. In a small bowl, combine the dressing ingredients, stir to combine. In a large bowl, combine tomatoes, cucumber, Kalamata olives, herbs and dressing. Stir to combine. This can be done up to a few hours ahead. Season chicken with salt and pepper. Place onion on a skewer. Using 1 T. olive oil, lightly brush sides onion, and both sides of romaine. Using 2 T. olive oil, brush both sides of the baguette. Season onion, romaine, and baguette with salt and pepper. Place onions and chicken on grill over medium high heat. Chicken will take approximately 5-7 minutes per side. When about halfway through cooking, add baguette and romaine, grilling for about 2-3 minutes per side. Remove all from grill. Cut chicken and onion into bite-sized chunks and add to tomato mixture. Stir to combine, then remove any excess dressing and set aside. Rub the garlic clove over the inside surface of the grilled baguette, then cut the bread into cubes. Add to salad. Coarsely chop romaine into bite-sized pieces and divide between four plates. 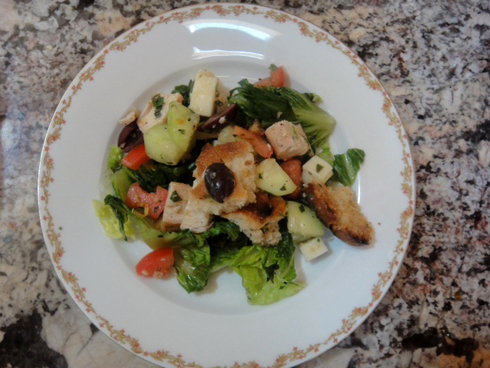 Scoop panzanella mixture onto each plate, top with mozzarella cubes, and drizzle with reserved dressing. Serve. 1. You could easily make this non-dairy by omitting the mozzarella. 2. For this recipe, I used a package of Just BARE Chicken by Gold’n Plump. I especially like these chicken breasts for grilling because they are so even in size and thickness, which makes cooking them properly easier for a grill novice like me. 3. 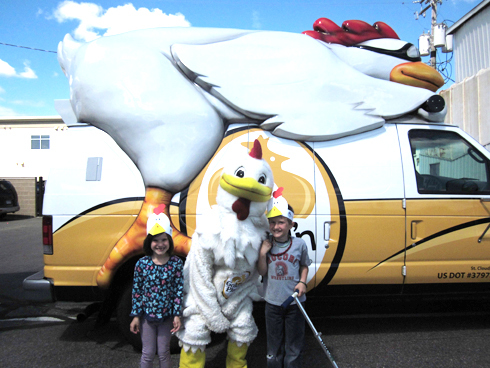 Chicken tastes better when wearing chicken hats. ← Cocktail Cards! or, Everybody Loves a Giveaway. I was lucky enough to have been present to test this and it was fantastic!